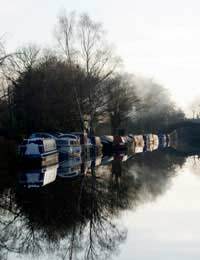 It’s important to remember that if you’re considering living on a boat, you shouldn’t just be making that decision based upon your wonderful experiences of a boating trip on some hot, sunny summer’s day when the nature and scenery is at its most resplendent and the wildlife is all around you - in fact, what could be more perfect? However, unless you’re only going to be living on a boat over the summer months, if the move is going to be permanent, you’re going to need to think about the possibly desolate winter months too. It’s not just the environment surrounding you that will change either. Your whole attitude towards living on a boat and the different maintenance aspects you’ll need to consider take on an entirely different perspective also. Even during the warmer summer months and the accompanying increased hours of daylight, there will always be some kind of daily maintenance needed on a boat and chores to do so in the winter, one of the things you’ll need to get used to is doing everything in a much shorter space of time, especially for jobs which require daylight. More complex maintenance duties may need to be put off until weekends but you’ll still have routine stuff to take care of such as changing gas bottles and filling water tanks so it’s important you keep a good torch handy. Unless you’re living on a boat in an all year round warm climate, keeping your boat adequately heated is going to be a constant issue you’re going to be dealing with far more often in winter so you’ll need to have easy access to the likes of bottled gas, coal, wood and petrol or diesel and, depending on how far you’re located from these kinds of suppliers, you may need to factor in additional time to get to and from the suppliers because of weather conditions and don’t forget that manoeuvring the likes of a large heavy gas cylinder down a potentially icy and slippery ramp is going to be a lot more problematic in winter than it would be in summer. The same could be said about your water supplies too. Furthermore, it’s crucial that you try to keep your water tank as full as possible and keep topping it up. This is because in extremes of cold weather, the stand pipes from where you might collect your water from could quite easily be frozen solid for days on end, maybe even weeks, depending upon your location. You’re far more likely to encounter storms and damaging winds in the winter as opposed to the calmer summer months, so even though you should already be fully aware and knowledgeable about securing your mooring at any time of the year, in winter you need to pay particular attention to that and the effects of adverse weather as the last thing you’ll want to happen is for your boat to break free from its moorings when you’re fast asleep or, perhaps worse still, if you’re not there at the time. Also, make sure that all your mooring ropes are in good condition too. Inspect them and other equipment which can be exposed to the weather well before the onset of winter and if anything is damaged or showing signs of wear and tear, replace it at the end of the summer or in early autumn and don’t wait for disaster to strike over the winter. Take extra care moving around the boat’s deck and when you’re getting on and off the boat over the winter. It could be icy or, at the very least, it’s likely to be slippier both on the boat and all around it. Make sure that you clear any ice or snow off the boat as soon as you can. As long as you’re well prepared and aware of the changes that winter requires of boat dwellers, you should be fine and you may even find that there’s a different kind of appeal to living on a boat in winter, all tucked up and cosy inside whilst outside it’s freezing and if it’s your first winter on a boat, it’ll likely present you with several challenges that you may not have envisaged. Nevertheless, if you come through winter OK and have still enjoyed the experience of living on a boat, then it’s almost certain that this new way of life is likely to suit you on a permanent basis as it’s often through experiencing the winter months for the first time which force many boat dwellers into thinking that, perhaps, living on a boat wasn’t quite the ‘idyllic dream’ they had envisaged. But if you have survived it and even enjoyed it, your ‘reward’ will be well worth it as spring will soon arrive and thoughts of summer will be just around the corner once again.